To hang my frames I’ve been using the precision picture hanging kit. The kit I used hangs up to 12 frames and includes hardware (receivers) to mount on your frames– if there isn’t already anything to hang them from. 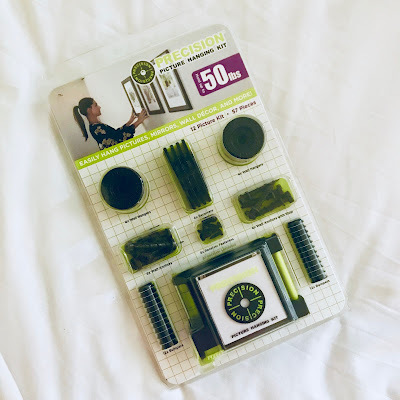 This kit made it super easy to create my mini gallery, I simply stuck the wall hanger on the wall, inserted a drywall screw with a Phillips head screwdriver and attached a receiver to the back of my frame. The 12 picture kit even comes with a level/tape measure/pen and paper tool to assist you in lining up the perfect gallery.